A flexible, robust and highly capable primary 4K camera for drama, independent film and documentary that is configurable for multiple production workflows, including support for HDR monitoring. Russell Carpenter takes the EOS C700 through its paces to see how it performs under pressure. See what Russell and the team thought. 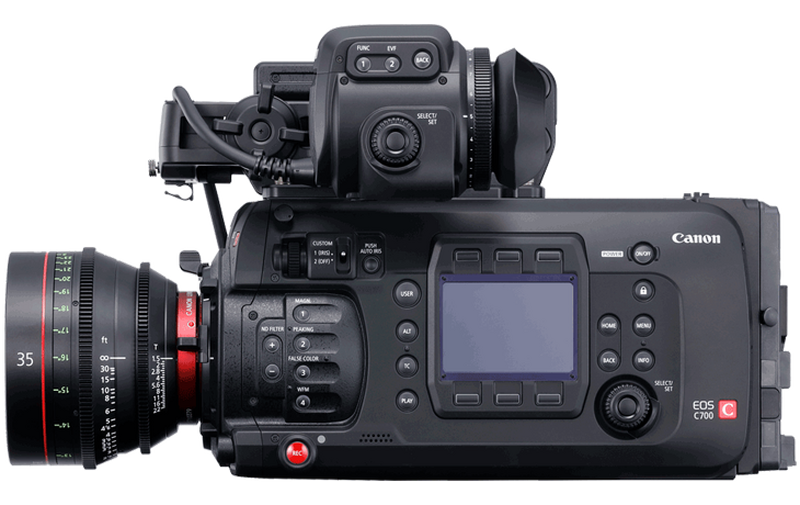 Canon’s Super 35mm sensor records outstanding 4K footage internally with 15-stops of dynamic range or full 4.5K RAW to the optional CODEX CDX-36150 recorder. Canon’s 4.2K Global Shutter sensor model records 4K/50P with no rolling shutter effect and up to 14-stops of dynamic range, making it ideal for shooting sports and events. Luxury yacht advert filmed on the EOS C700. Check out this C700-shot advert for luxury river yacht company Woods’ Silver Fleet. A dedicated and dockable CODEX RAW recorder offering enhanced and optimal performance with the camera, allowing for higher frame rates and a familiar workflow. A high resolution (1,920x1,080) OLED electronic viewfinder with a wide colour gamut. The 50cm UN-5 cable is included with the C700 whilst the 100cm UN-10 is an optional extra. An additional operation panel than can be attached to the right side of the camera or can be used off camera with different lengths of dedicated cable (UC-V75 / UC-V1000). Connect the Remote Operation Unit OU-700 to the camera with a 75cm or 10m cable, for multiple operator applications. A dedicated shoulder support with split sliding shoulder pads for added comfort and rods. Can be used with the SU-15 Shoulder Support Unit to offer the operability of a shoulder mount camera with REC, zoom and iris controls, supporting the 12-pin lens connector. The Remote Controller RC-V100 provides extensive wired remote control of your camera for greater shooting freedom. The Canon RR-10 (10m) and RR-100 (100m) are compatible with the Remote Controller RC-V100 and the 8-pin remote terminal for enhanced performance short or long range connectivity. Wirelessly control the camera or stream Full HD footage. The GP-E1 features an electronic compass and GPS signal receiver to record time, longitude, latitude and elevation directly into the metadata of every shot. A lens mount service option offers the capability to change the camera’s original EF Mount to a PL mount and back again. A sensor service option offers the capability to change the camera’s sensor to a different sensor (e.g. Global Shutter) and back again.